Stay ocean-side and enjoy many benefits of an ocean front complex with easy access to the beach. Guest staying at Ocean Club 17 can enjoy a landscaped courtyard on the pool with a nice ground floor patio. King in the master bedroom, Double & Twin in bedroom 2, plus a living room sleeper sofa. Coligny Plaza is a short walk away with several shops and restaurants. The ground floor entrance to the condo makes it easy to park and enter right in front of the condo without steps. Ocean Club 17 has a scenic patio for entertaining and relaxing just off the pool area. The living room has a large 50 Inch Flat Screen Mounted, and two recliner chairs perfect for the end of the beach day wind down! Enjoy Hilton Head's most popular beach while staying at Ocean Club. When we arrived it was clear the place had been shut up for a while and the beds weren't super comfy. We discussed visiting again until we were harassed twice by two different men claiming to be the president of the regime. We paperwork inside the place said that the pool closed at 10:00pm. At 8:15 a man came out and demanded we leave the pool. We would have never booked this place with our three kids if the pool closed early as the man stated. The other guy saw us walking up the boardwalk and demanded he know where we were staying and accused of us not staying on property and coming up from the beach to use the pool. Just my opinion, but it seemed like these guys do not want tourists/renters in their community." This was the third year in a row that we have stayed in the same condo. We like it very much." Jul 17, 2018 - , Simpsonville, S.C.
We had a great time staying in this condo. It had the essential items needed for a 3 day weekend away. We have 3 kids, including a one year old and loved that it was just a quick walk from this unit to the pool...made it easy to walk back and forth to get snacks and for nap time. The kids loved having a pool available too. 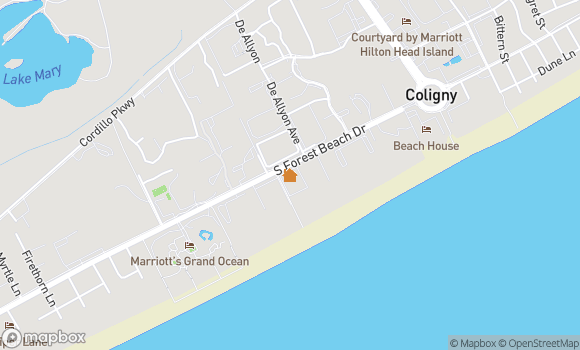 We were close by to Coligny Plaza and shops/restaurants. Had a great trip and would definitely stay in this unit again. " The overall look was updated and looked very different from the pictures online. The place was not clean. We found hairs in master room bed and we found a dried contact on a pillow. The corners in the bathrooms were caked with sand. In the hall bathroom, their was a used washcloth hanging on the shower rod. I did call the rental office and they wanted to send someone to clean. With only four beach days, I didn't want to wait to show someone what to do. I did wash the sheets. The dishwasher didn't seem to work well either. The property is ideally located and with a little more cleaning care, it will be perfect. " Everything was very easy. The new pathways to the pool and to the boardwalk were great. It made getting around a breeze. We had great weather and a great time. " Condo was located in a perfect place, with help of a beach wagon getting to beach was a breeze! We had a wonderful time, condo very spacious and comfortable. Only thing I would suggest is fixing AC in bedroom with twin beds, very muggy and hot despite AC being turned down low- rest of condo very comfortable." Good week. Weather was great, and condo location was awesome. Only negative was, the parking space designated for this unit is not marked like the rest of the spaces for other units. So you will be looking a guest space, if it is a crowded week. " All the important things were good--service, cleanliness, helpfulness, etc. We were missing some little things in the condo: no dish soap, only 1 garbage bag and an inoperative bathtub stopper." The condo was a perfect fit for our family. The pool has been remodeled and the ocean is just steps away. Everything we needed was in the unit and Colingny is an easy bike and walk away! " Unit had everthing we needed for stay, fully stocked. Very comfortable. Pool area is great and always has a partial shade area. Patio is lovely. Unit is in need of some updates. But it was comfortable and it was clean (except master bath).We flew in so it was nice that there was an umbrella and a couple old beach chairs we could use." Great accomadations, loved the deck"
This ground level condo was perfect location from pool and beach. I was very pleased with the condition of the residence and overall property. I would recommend this property to freinds and return in the future." We loved the unit very accessible. Unit was cozy and comfortable. Location was great ! The top vacation stay for sure !!" It was ok. When I got there food was in the sink. Plugs in the condo would not hold a plug in. Only one garbage bag. No wifi. It was centrally located and was safe if you wanted to walk or bike. The patio was outstanding with multiple grills , great chairs, close to the pool, a garden hose, it was super. Inside needs an upgrade . Worn but nice. TV s were ok. Still no WiFI. Only condo without. I needed it to work. I think I will use a resort next time." Nice Condo. We had four condos for our family. All were very nice." Very relaxing and what we expected. gate to pool needs to be fixed--handle is broken."